In the book of Daniel, there’s a reference that’s always intrigued me to a being called “a Watcher, a Holy One.” I think such beings are usually explained as some kind of angel. I suspect – though I’m not sure – that some characters in Mark W. Sasse’s Forgotten Child Trilogy may be meant to be the same kind of creatures, though here they’re not exactly angels. 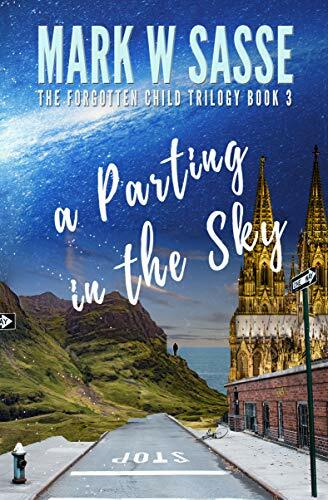 A Parting In the Sky is the third and final book in the trilogy. Our protagonist, Francis Frick, a repentant arms merchant, does not actually do a lot in this volume, being confined to a hospital bed. The main characters are Ash, a “watcher,” and Hatty Parker, a young black woman who has become Francis’s friend and ally. Another main character in the previous books, “Bee,” a sort of giggling fairy who loves pomegranates and blithely disregards the rules by which Watchers operate, also plays a diminished role. Bee is beloved both by Francis and by Ash, but she is banished from our world for her insubordination. However, in her absence Ash finds himself restored and strengthened, and he carries on her program for Francis and his friends, to the anger of his superior. The wicked arms merchants against whom Francis and Hatty are now working are planning a major act of terror before fleeing the US with their ill-gotten gains. Hatty willingly surrenders herself to her enemies, trusting that the powers watching over her will use her to stop the evil. Things will work out in a way beyond anyone’s hope. The Forgotten Child trilogy is as strange a series of books as I’ve ever read. I can’t claim that the writing is elegant or precise – Sasse doesn’t know how to use the word “myriad,” for instance, and he makes other errors of diction. But I enjoyed the books immensely. There’s an innocence and simplicity there (worked into a very complex, globe-hopping plot) that pleases and delights. They’re the kind of books that might be Christian, but the Christianity is obliquely expressed. There seems to be an argument about theodicy embedded in the story. I recommend these books. 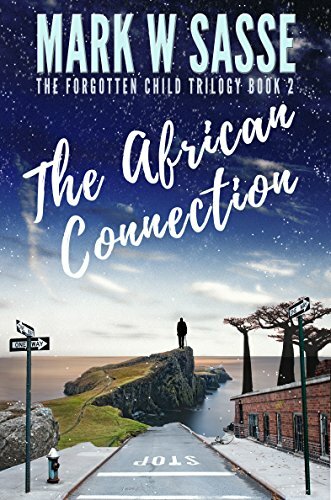 Mark Sasse’s bizarre “Forgotten Child” series continues with The African Connection. An unconventional fantasy in an unconventional trilogy. I got a free review copy from author Sasse. 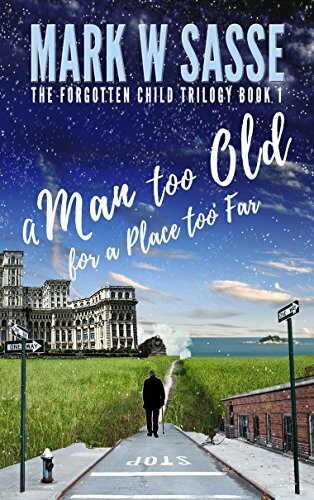 The first book in the series, A Man Too Old For a Place Too Far (which I reviewed previously) told the story of Francis Frick, the original Nasty McNasty, you might say. Rich, powerful, greedy, cruel to his employees and to his daughter, he seems irredeemable. Until he is awakened one night by “Bee,” a fairy-like creature who hovers over his bed eating a pomegranate. She transports him to strange places and past times, where he gradually learns to empathize with others, and finally saves a child from the Cambodian holocaust. He also finds a cause – destroying Heinrich Ulrich, an amoral arms dealer with whom he formerly did business. But there are repercussions on the spiritual level – Bee is not following the rules for spiritual beings. Disaster follows, in a cliff-hanging climax. In The African Connection, we find Francis in FBI custody, frustrating the agents with his nonchalance. Meanwhile Hatty Parker, a young woman, a new character in the story, steals a document linking her boss to Heinrich Ulrich. Arrested by the FBI as well, she ends up accompanying Francis on a series of hops through space and time, in which they grow attached to one another and he learns shocking things about his own origins. And gradually their support from Bee diminishes, as she finds herself under pressure from other spiritual beings, and in danger of losing her protector, the powerful Ash. The African Connection is a strange read – I still haven’t made up my mind whether it’s quirkily brilliant or just naïve. It can be very funny and very poignant in turns. There are a few instances of mistaken word use – “extolling” for “exhorting” – that sort of thing. Still, I’m interested in finding out how it all turns out. No cautions that I can recall for language or objectionable adult themes. Recommended.